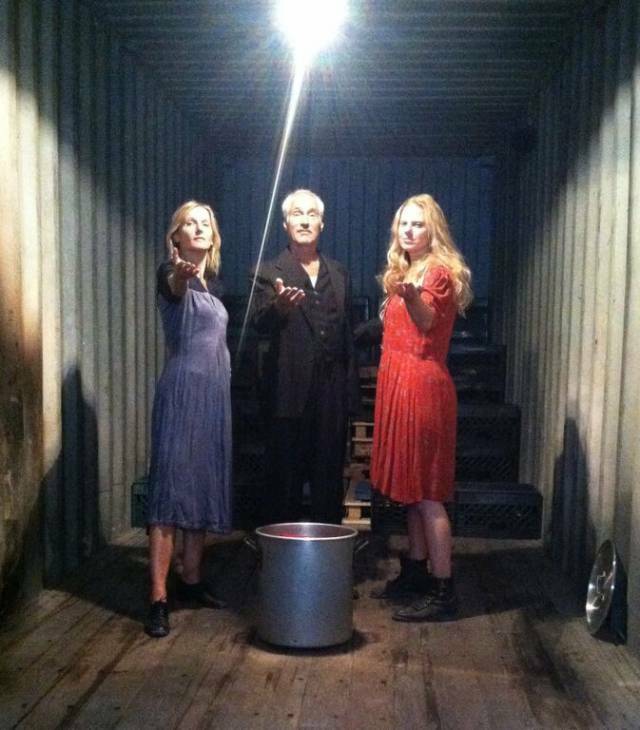 Yvonne Brecht, Matt Mitler and Megan Bones in Dzieci Theater Company’s MAKBET. Photo by Thea Garlid. If you happen to be strolling in Brooklyn down McKibbin Street and hear an aggressively passionate sound arising from a graffitied crate junkyard... step inside, you won't soon regret it. Contained within a petite, abandoned shipping crate are the five feature members of the Dzieci Theater Company recreating the turbulent story of Macbeth with the help of a few vital costume pieces. The spontaneous Gypsy-style retelling of Shakespeare's tale is orchestrated by the passing of a feathered hat, a blood-red cloak, a pair of round spectacles, and a heavy trench coat, each piece holding the power to transform the actor who dons it into a new character. The rules are simple: actors must know the entire text, actors may not play the same role in successive sequences, roles can be taken or given, and nothing else is planned. When the metal doors to the crate are closed, Makbet begins and there is no going back. You are no longer in a shipping container in a junkyard in Brooklyn, but immersed in an eastern European kingdom and being handed potatoes and sausage from a lady with blonde braids and a red dress. This same lady (Megan Bones) plays a slew of other characters at the drop of a hat -- which she swiftly picks up, assuming the role of Macbeth himself! The fast-paced nature of the performance requires audience members to be fully committed to the show, lest they miss a character transition. The confined space is an asset for the production, which would be undoubtedly less magical on a proscenium stage. Makbet, successfully adapted, directed, and acted by Matt Mitler, triumphantly recreates the the story of Macbeth in a shockingly unconventional way while maintaining the integral notion that Fate cannot be fought against. Perhaps what is most memorable about this piece of art is the opening and closing Eastern European songs that are ceremoniously sung, giving the audience a small wrinkle in time to reflect in the present moment. The chants can be felt on a deep and literal level as the six voices reverberate off the metal walls of the cozy container and fill the air pockets of the junkyard, creating an otherworldly sensation. Those lucky enough to attend Makbet will thank Fate for allowing them to end up at such an important theatrical experience.